YES! I want to take advantage of this great, subscription gift offer. Risk Free Guarantee: Cancel at any time and we'll refund you for all unsent issues. Would you like to receive subscriber discounts & special offers via e-mail? Would you like to receive special offers on behalf of specially-selected third party companies? Give a gift today and your friend or loved one will receive the most informative, up-to-date casino news and information from casinos across the country. Every month they'll read expert strategies, money-saving advice, inside information, detailed slot payout percentages, expert insight on all your favorite games and much, much more! And, with their gift subscription, they'll also receive a gift card announcing your gift. 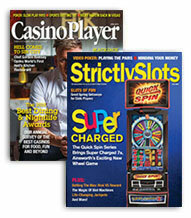 CASINO PLAYER & STRICTLY SLOTS are published 12 times per year. I can cancel at any time during the subscription and receive a full refund on any un-mailed copies by calling 1-800-969-0711 or emailing customerservice@casinocenter.com.